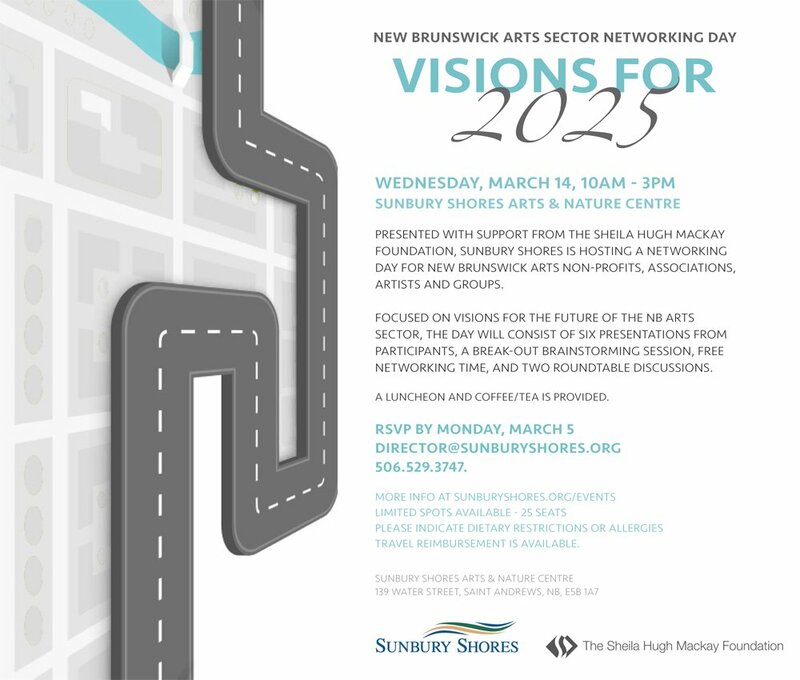 Presented with support from the Sheila Hugh Mackay Foundation, Sunbury Shores Arts & Nature Centre is hosting a networking day for New Brunswick arts non-profit organizations, associations, artists and groups. Focused on visions for the future of the NB/Maritimes arts sector, the day will consist of six presentations from participants, a break-out brainstorming session, free networking time, and two roundtable discussions. Click HERE for the draft agenda and more event information. If you are interested in presenting at the event, please email or call, as we would like speakers to self-nominate. This event includes a complimentary luncheon in the beautiful Harbour View Gallery and coffee/tea and snacks will be provided. RSVP by Monday, March 5 to director@sunburyshores.org or call 506.529.3747. Please indicate dietary restrictions or allergies.